If you are looking for information on the Pier 49 Pizza franchise business opportunity, Pier 49 Pizza franchises or Pier 49 Pizza franchising, then you have come to the right place. If this is your first experience with Pier 49 San Francisco Style Sourdough Pizza, then get ready to fall in love with the most delicious gourmet sourdough pizza available. It's no secret that pizza is one of the fastest growing segments in the restaurant industry. As the competition heats up, the demand for quality, consistency and value also increases. A recent study has shown that the average family buys a pizza each week and quality, price and consistency all play a strong role in their buying decision. 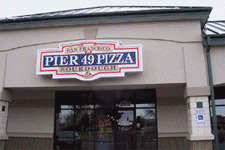 Pier 49 San Francisco Style Sourdough Pizza has set the new standard with gourmet quality, taste and excellence. 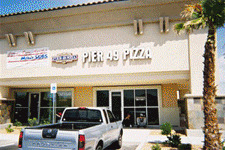 Pier 49 San Francisco Style Sourdough Pizza was crafted and developed in 1991 and has grown to 21 pizza restaurants located in Utah, Idaho, Arizona, Nevada and Colorado. Additional locations are opening every month. The exclusive Pier 49 San Francisco Style Sourdough Pizza crust is our foundation. Add the finest gourmet sauces, cheeses, and toppings and you have a truly remarkable pizza. Fifteen gourmet pizza recipes, dozens of fresh toppings, tantalizing appetizers, fresh garden green and gourmet salads and oven-baked sandwiches come together to create a winning menu for success. With each new location and each week, the new standard for the most delicious gourmet sourdough pizza is being set. Coupled with a great product, the Pier 49 San Francisco Style Sourdough Pizza name and innovative marketing create an inviting alternative to the norm. More and more people are demanding better quality food, consistent service and value-packed menu selections. The Pier 49 package gives them exactly that. Part of what makes a Pier 49 San Francisco Style Sourdough Pizza restaurant such an exciting opportunity is the relatively low investment required. Add to that our competitive product costs, the satisfaction of owning your own business, and you've got a recipe for success. With a Pier 49 San Francisco Style Sourdough Pizza restaurant, you'll be up to speed and on the entrepreneurial track in a short time.